Music can define our mood, uplift our spirits and stimulate our senses. Rock, jazz, blues, gospel, soul, electronic, folk… so many strands to choose from. The latest design study from leading German aviation textiles specialists, rohi and ANKER, to be revealed at Aircraft Interiors Expo in Hamburg, 10-12 April, 2018, has taken those strands and weaved them into an exciting and vibrant new range of fabrics and carpets. Following last year’s ‘Create TIME’ project, the two companies have again teamed up on an innovative in-house design study to hone their skills in interpreting any idea into a conceptual collection of stunning fabrics and carpets. 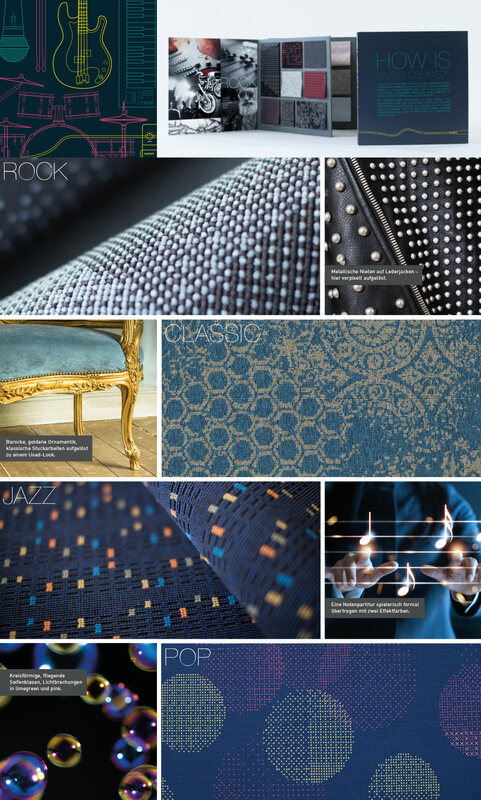 To help shape its solutions, the two leading manufacturers in premium aircraft textiles listened and then translated a number of classic genres into individual components: ‘Rock’, ‘Classic’, ‘Jazz’ and ‘Pop’. Together, they form ‘Create MUSIC’. Such innovation remains a hallmark of both companies, which share a similar family-owned history and ‘made in Germany’ quality. Both have won numerous design awards for their work, while their clients include some of the world’s leading airlines, such as Emirates, Lufthansa and Singapore Airlines, as well as iconic contemporary domestic furniture brands such as COR, Knoll International, Rolf Benz, Thonet and Vitra.